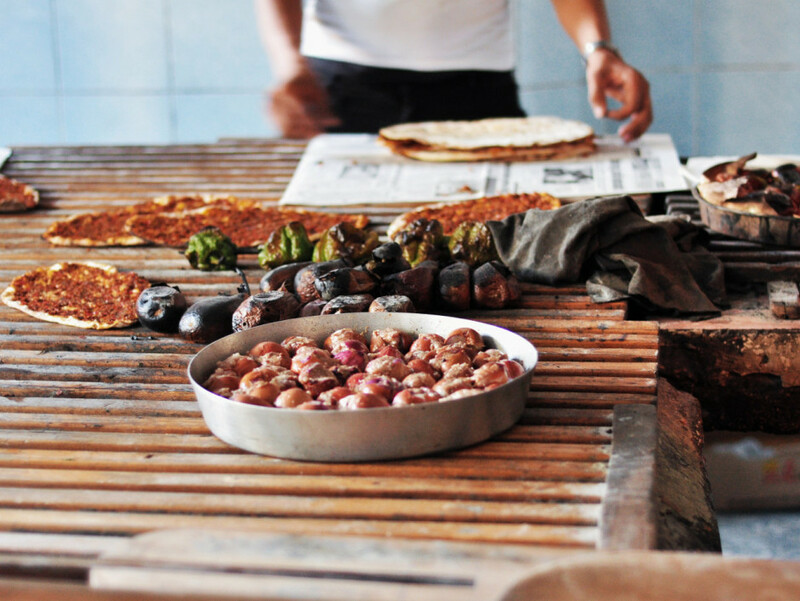 Kebap, the cornerstone of modern Turkish cuisine, simply means “charcoal-grilled” and includes dishes as disparate as kestane kebap — roasted chestnuts sold in paper bags by street vendors on winter days. The better-known meat dishes come in different styles depending on the region of origin: the spicy Adana; the mellow Urfa; the Antep, sandwiched between thick eggplant slices; a simple dürüm wrap in thin unleavened lavaş bread. The most famous is the İskender kebap, invented by İskender Efendi of Bursa in 1867, where razor-thin slices of lamb are smothered in yogurt, tomato sauce, and butter. This humble snack traces its roots to the 16th century. Caravan travelers to and from Istanbul would load up on the bread rings in the nearby town of İzmit, which lent its name to this early example of fast food. 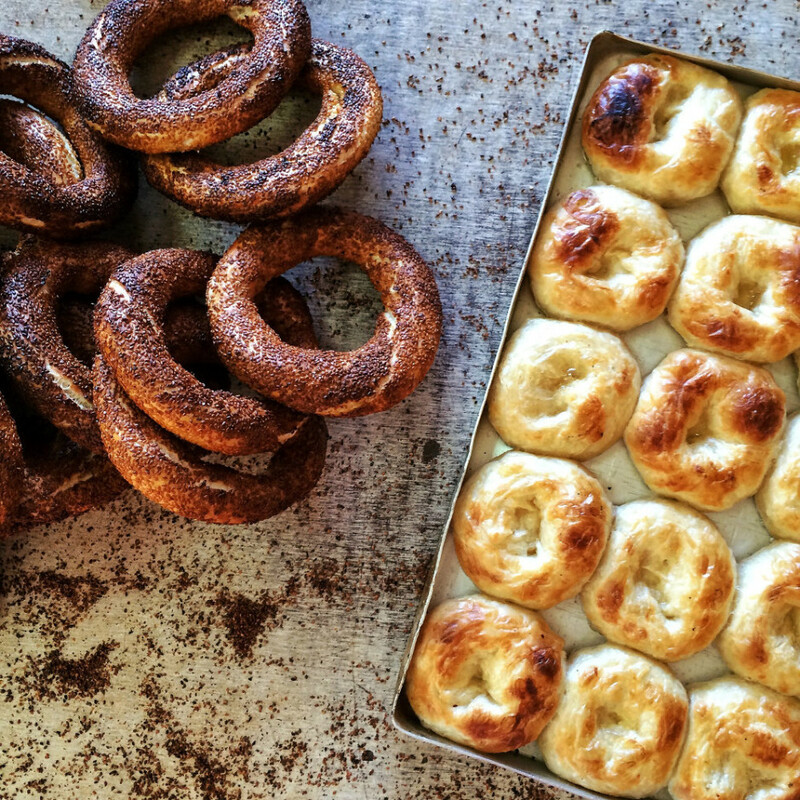 Today the sesame-encrusted simit is both a breakfast staple and a popular street food. 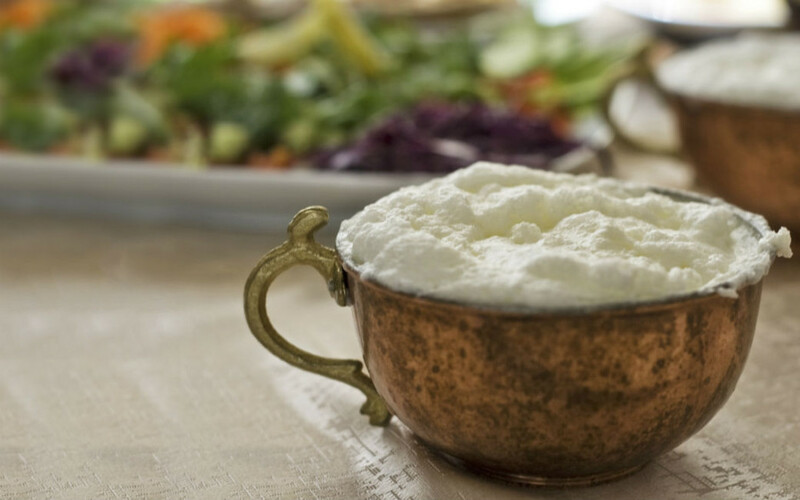 Turks adore their yogurt, spooning up more than 2 million tons of the white stuff each year. Originating a millennium ago in Central Asia, its longevity served a nomadic culture well. 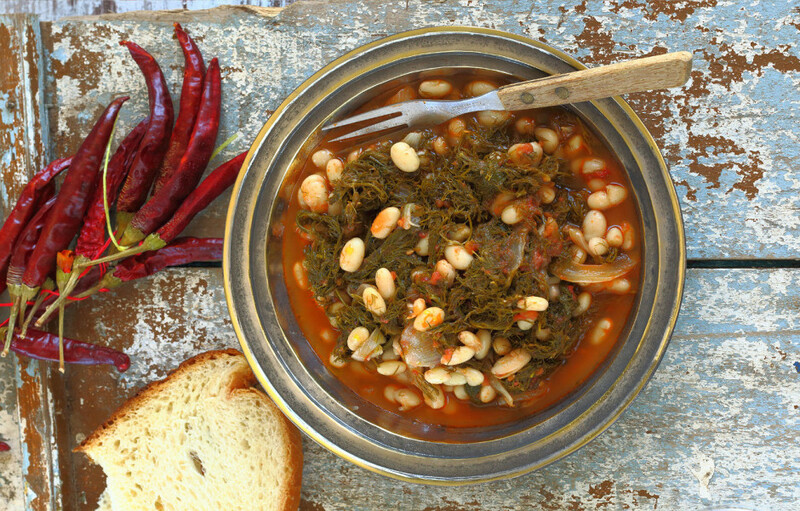 Today it’s eaten plain or serves as a base for soups and salads like cacık. A favorite beverage is the cool, salty ayran. 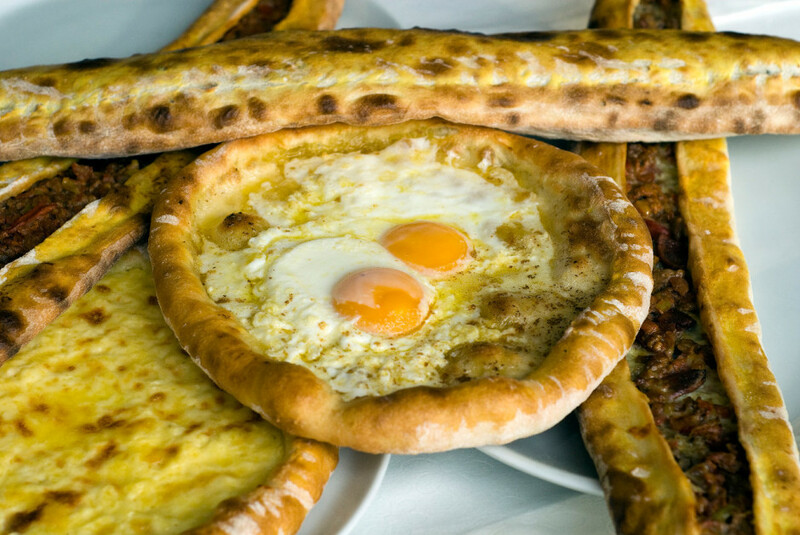 The Turkish breakfast will make even the committed night owl a morning person. 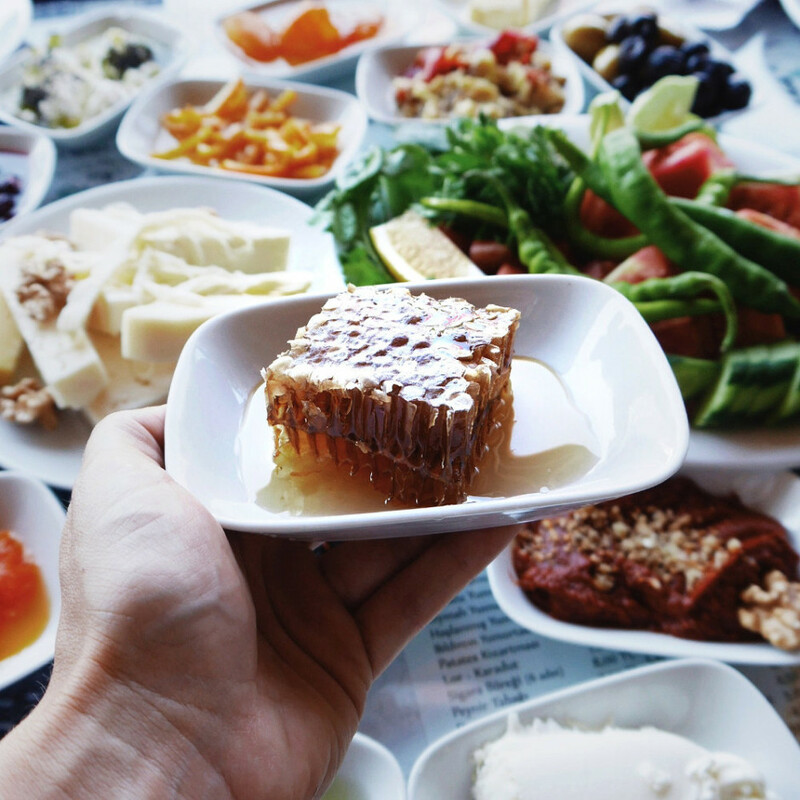 Oven-fresh bread accompanied by honey and Turkish clotted cream (or kaymak), preserves like rose and fig marmalade, sheeps’ milk cheeses, and tomatoes and cucumbers drizzled in olive oil are standard fare, but every region has its own specialties. If you have any room left, try the menemen: runny scrambled eggs cooked with onions, green peppers, and tomatoes. Lokum is often flavored with rosewater, the delicate, sweet fragrance once cherished by Ottoman chefs but now surviving in just a handful of desserts, like güllaç. Turkey is the world’s biggest producer of Damascus roses, whose prized oil is a key ingredient in perfumes. Its petals also make incredible marmalade or can be infused in apple vinegar and olive oil. To visit the epicenter of rose production in Turkey, check out the town of Isparta, north of Antalya. This dessert actually hails from Central Asia and spread from there throughout the Ottoman world. It eventually made its way to Europe, where the Viennese modified it as strudel. 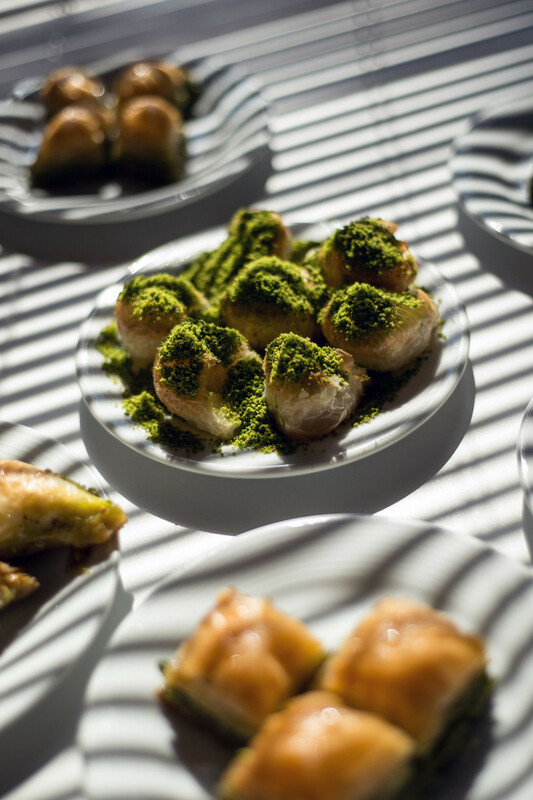 Today, the indisputable baklava capital is the city of Gaziantep, where the sweet stacks of fine filo pastry, drenched in milky honey and covered in pistachio nuts, are an art form. That tub of Nutella on your breakfast table probably started life in an orchard in the Black Sea provinces of Giresun or Ordu — Turkey accounts for 75% of the global hazelnut crop. It also ranks among the world’s top five producers of a slew of other goodies, according to the UN Food and Agriculture Organization: figs, cherries, strawberries, peaches, melons, watermelons, mandarin oranges, apples, chestnuts, walnuts, pistachios, olives, lentils, chickpeas, green beans, peppers, tomatoes, cucumbers, eggplant, beets, and honey. Dig in! Dubbed “Turkish pizza,” pide is flatbread baked in a wood-fired oven. It comes with a variety of meaty toppings: sucuk (Turkish sausage), pastrami, and minced (kıyma) or chopped (kuşbaşı) lamb meat are popular offerings. Cheese and veggies are also utilized. There are restaurants completely dedicated to this dish, and in most of them the cook will break an egg on top of your pide when they take it out the oven, which keeps everything super succulent. Lahmacun is a simpler version, just a thin piece of dough covered with mincemeat and herbs. Other flour-based baked dishes include börek, baklava’s savory cousin; and gözleme, hand-rolled dough stuffed with cheese, spinach, or meat, then cooked over a griddle — and best consumed after a swim at the beach. 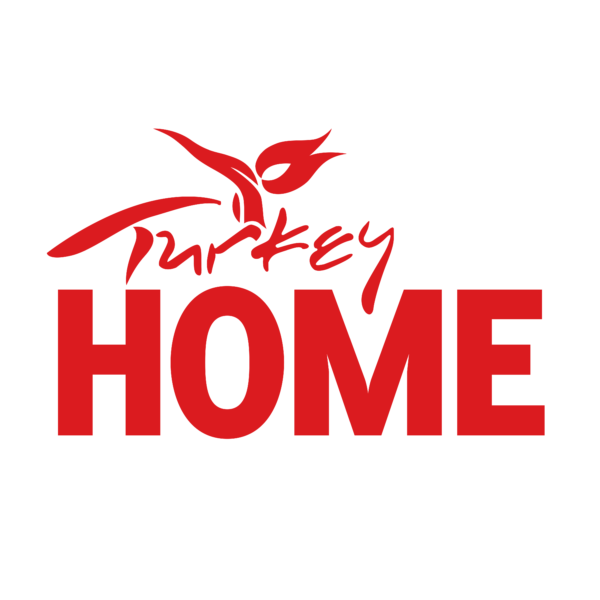 For more on this quintessential Turkish dish, watch celebrity chef Arda Türkmen as he gives you the low down. Turks will pickle just about anything. Eggplants, tomatoes, cabbage, plums — there are even reports of pine cones — they all get immersed in tart vinegar. These treats are then jarred and stocked on the shelves of traditional turşucu shops where the colorful displays are almost too pretty to eat. Almost. Turkish ice cream is like no other you’ve had. For a start, it has the distinctly smoky taste of natural mastic, and second, the texture is far chewier than its soft Italian cousin. The thickness comes from salep, made from the root of the Orchis mascula, and the cool treat is now so popular scientists have warned it may endanger this rare orchid. 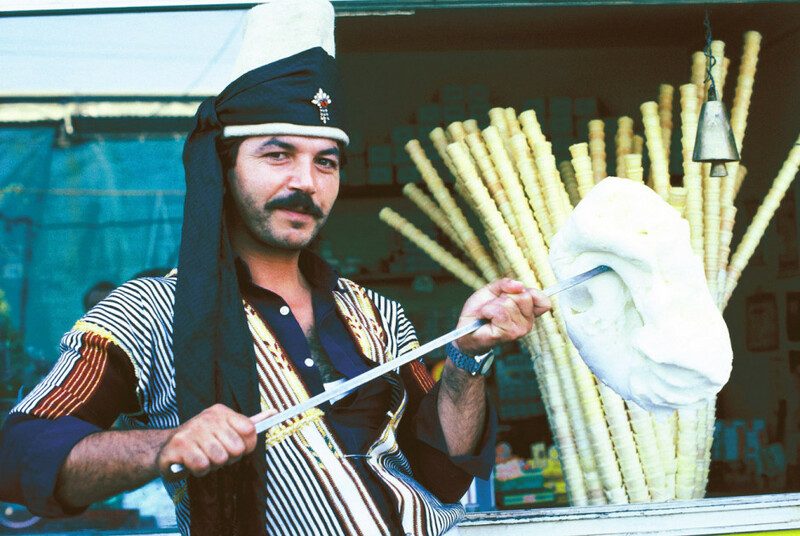 Buying a cone of maraş dondurma from a vendor dressed in a regional Maraş costume invariably comes with a not-to-be-missed sleight-of-hand performance. Just watch. In almost every country, from Poland to Japan, there’s a version of meat wrapped in steamed dough. The Italians call it ravioli, the Georgians eat khinkali, and Turks tuck into plates of mantı. This version of dumplings is served with dollops of fresh, tart yogurt, doused with melted butter, and sprinkled with chopped herbs and chile flakes. It’s as tasty as it sounds. 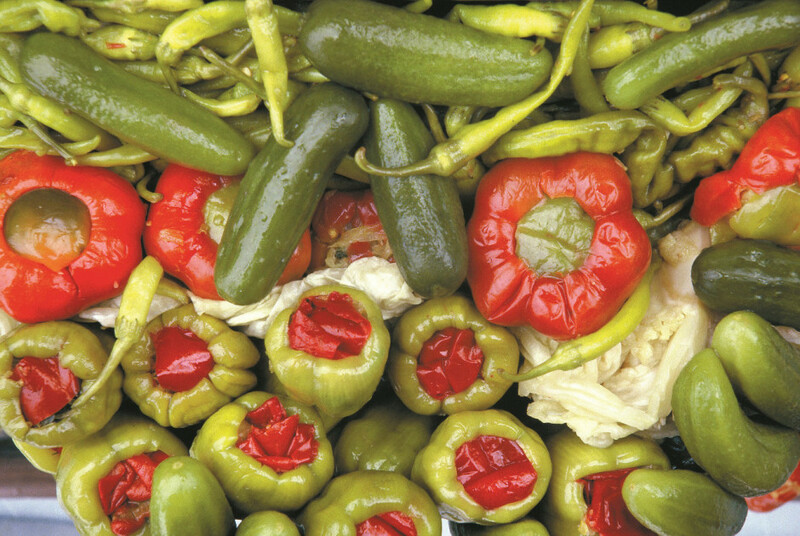 Turkish dolma is a dish where rice and meat gets stuffed into hollowed-out peppers, tomatoes, zucchini, or dried eggplants, then slowly braised. Sarma sees the same ingredients rolled in vine or cabbage leaves. Both are a staple at the table for nearly every occasion. This modest dish of creamy blond beans stewed in tomato gravy has adherents whose sensitive palates can distinguish which usta (master) cooked the dish from among thousands of beaneries dotting the country. 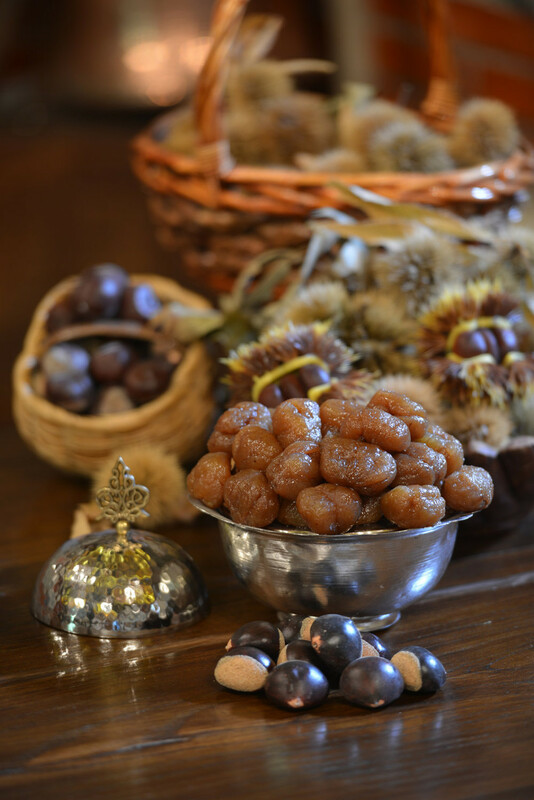 Turks have very sweet teeth, and sugared chestnuts, or kestane şekeri, are just one of a plethora of candied fruits, vegetables — even nuts with their shells still on — you’ll find here. Kestane şekeri have especially long roots that stretch back to the 1300s and the former Ottoman capital of Bursa. The signature Ottoman dessert is tavuk göğsü, or chicken breast pudding. This strange-seeming blend of boiled chicken, milk, and sugar that’s been dusted with cinnamon is — perhaps surprisingly — delicious. Pictured above is the caramelized version, called kazandibi. Turks call these delicate cubes of jelly lokum, which derives from the Arabic word for “morsels.” The confection comes in a dazzling variety of flavors, shapes, and colors and is dusted with icing sugar or coconut and sold by the handful in picturesque boxes. They’re also frequently served alongside Turkish coffee at the end of a meal. And while we’re on the subject, we couldn’t end this list without mentioning coffee (kahve). First appearing in the imperial capital of Istanbul in the 16th century, coffee has been part of the fabric of life here ever since, lending its name to breakfast (kahvaltı, or “before coffee”) and even the color brown (kahverengi). Turkish coffee is a method, not a flavor, and it takes a truly skilled barista to keep the brew hot enough to cook each cup with a head of foam and fine grounds at the bottom. 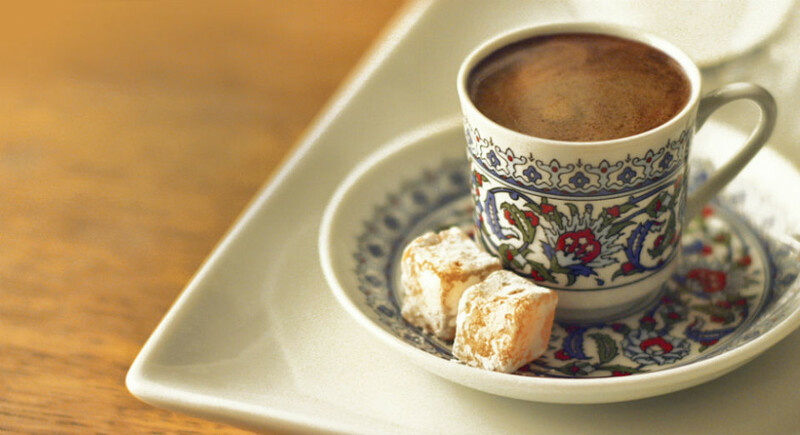 Once you’re finished, a good Turkish host will turn your cup upside down and study the grounds to divine your fortune.